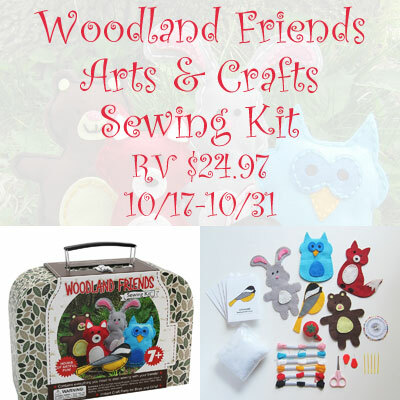 and provide hours of fun, look no further than this Woodland Animals Sewing Kit. Disclosure:Tales From A Southern Mom did not receive compensation for this post and is not responsible for prize fulfillment. My kids like to bake or do crafts on rainy days. On rainy days we like to bake cookies! We love to do crafts. Rainy days mean movies and board games and a few crafts! My kids like to paint, make jewelry, really any craft! We love making all kinds of crafts on rainy days. Puzzles and board games are their favorite rainy day activities! We like to watch movies and also use our cool pens and color! We do crafts and probably too much TV on rainy days! We like to watch movies! My kids love Play Doh on a rainy day. My kids and I love to watch movies and do crafts on rainy days! We get a lot of those rainy days in Northern California! Thanks so much for the opportunity to win!